What Makes A Bad Logo? We spend a lot of time discussing about what makes a great logo, so we thought it was time we showed you some examples of what DOES NOT make a good logo, but what makes a bad logo. One of the best ways to distinguish a business is by having a unique and memorable logo; but designing a unique and memorable logo is not as easy as it seems. Here are some common logo design mistakes that amateur logo designers do. Typography in logo design can either make or break a design, so it’s important you know your typography. A logo should be kept as simple as possible while still portraying the intended message, and to achieve this a designer must consider all typographic aspects of the logo design. It is a skill that is learned, not done on the spare of the moment. Don’t use too many fonts. Don’t use crazy fonts, I believe a simple and timeless font always works. Pay close attention to kerning, spacing, and sizing and most importantly, ensure you’ve chosen the right font(s) for the project. 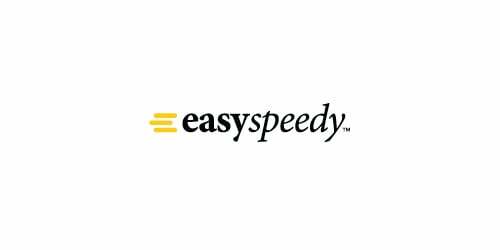 EasySpeedy Logo: See how this logo uses just one font but with different styling. The italic convey speed while the bold conveys ease. When it comes to creating a logo, choosing the right font can make or break a logo. The fonts chosen can often take just as long as the creation of the logo icon itself, and it should not be done quickly. You need to spend time researching all the different font choices that could be used for the logo, narrow them down, and then see how each one works with the logo. Keep in mind how the logo’s font could be used across the rest of the brand in conjunction with other fonts. 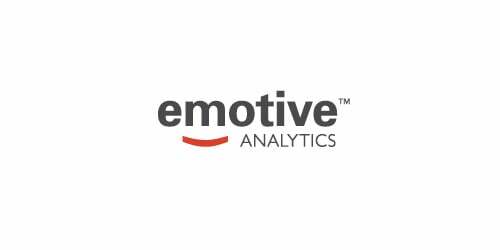 Emotive Analytics: Every font has it’s own personality, so you need to choose the right “font personality” for your logo. The font chosen in this logo is much more serious. Memorable logos are more successful as they allow for easier recognition; but for a logo to be memorable it must have something unique about it. Simplicity just doesn’t make a logo more memorable, but it also helps the logo to be adaptable, this means it can work over more mediums. For example logos need to work on something the size of a stamp and on something as large as a billboard. So don’t make the logo too complex, keep it simple. If a logo requires a special effect to make it a stand out, then it’s not a strong logo. Start off by working in black and white first, and then add the special effects. This will allow you to focus on the shape and concept, rather than a special effect. Don’t use drop shadows or embossing to luster up your logos — a good logo will stand on its own. 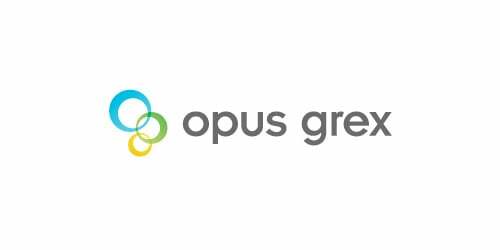 Opus Grex: So yes this logo does have gradients and colour, but if we took away these effects it still is strong, and simple. A logo has to be designed in a vector graphics program like Adobe Illustrator, to make sure that the final logo can be scaled to any size, this helps the logo to be applied easily to any media. A vector graphic is made up of precise points, these ensure visual consistency across all mediums and sizes. A rastered image (is made out of pixels, like what you would find in Adobe Photoshop) can’t be scaled to any size, this means at larger sizes, the logo would be not usable. Make sure you use a vector graphics program when creating logos. Light bulbs for ‘ideas’, speech bubbles for ‘discussion’, etc. These ideas have been done over and over again, they are often the first thing to pop into someone’s head when brainstorming, and for the same reason should be the first ideas to be not used. How is your logo going to be unique when so many other logos have the same idea? Just stay clear of these visual clichés, come up with an original idea logo. In a world where we can easily rip something off the internet is just all too easy, and it’s an all-too-common practice these days to steal or copy another design. A designer sees an idea that they likes, does a quick change, it could be a colour change, and then calls the idea their own. This is unethical and downright silly but you’re also going to get caught sooner or later. And do not use clip art either — isn’t the point of a logo to be unique and original? Yes, the client is paying you as a professional to come up with a design, which means you need to direct the client to the best possible solution. The best way to do this is to offer your experience, so not let them direct the project. If a client asks for a change that you feel will not work, explain why and offer a better alternative. If they refuse, then send your own design changes, as well as their suggestions. They often realise that their suggestions may not have been the best idea, but you as a logo designer should also realise that you also, are not always right, so try and give the client’s suggestions a look — you never know, sometimes they are right. Even though you as a designer may have a lot of concepts you have worked on, you need to use your expertise and narrow it down. If you provide 8 concepts to a client, you run the risk that they may choose what you consider is the ‘worst’ out of the lot. A good rule of thumb is to only send three concepts that you personally feel would work the best for their business. Delivering the final files to your client is one way to make sure that your client doesn’t comes back asking for more changes. It also allows the logo to be displayed correctly in all formats, which cane be supported by a logo style guide. You should provide the client four high-quality files — spot-colour file, a CMYK, a black file, and a reversed (white) one. These generally are in EPS, JPEG and PNG formats. The above logo design tips should help you become a greater logo designer, but it’s important to let you know that although lists such as these are a good starting point, they should not hold back your creativity — having said all the above rules are made to be broken & there is no ‘right’ way when it comes to design. What is frustrating about being a designer is most clients have no idea the process involved in designing a professional logo. When clients ask for a quote and I tell them, they usually respond saying ‘Oh, that’s too much money’. They have no idea how long it takes, the amount of hours invested into creating and delivering a logo that is unique and will stand the test of the time. This post explains our design process in getting to a professional logo design. It takes careful planning, hard work and an understanding of the client’s requirements and wishes, but ultimately you are there to give them what they need, not what they want. The initial growth of information from the client is the most important step, it should be a face to face interview or if that can’t be done then a questionnaire. This is where you must establish the design brief. It’s critical to really understand your client very thoroughly before you get started. Logo Design is not just guessing. After establishing the design brief, getting to understand your client’s businesses is the next important step. Research includes general reading on the industry, analysis of current and future industry trends, sometimes the businesses history, its competitors. If you can convince your client to invest the extra budget some external research can be carried out. This is where we seek and find other logo’s similar in the clients industry to get some ideas and inspiration. In short terms we find logos of similar business’ and critique them, and collate a collection of ideas. This is where we look for inspiration. We look more for techniques to ask ourselves why a certain logo looks like it does, what makes a really good business logo: or for why do we like this logo and dislike the other. All designers should do this to get a better understanding of the industry and competition. Developing the logo design concepts is where creativity comes in, this is where a designer must create the logo by using the design brief and the research conducted as per mentioned above. Some designers use a sketchbook to scribble down their ideas whilst some use the computer as their sketchbook, it all comes down to personal choice, however we believe using the computer first is not the best first step. Taking a break is important because. It is easy to get stuck in a creative cul-de-sac (learn how to be creative) and get tired of a project which is why designers take breaks. By walking away and having a rest means your creative ideas mature and develop in the back of your head. When you go back to your logo, you have insight and a clear head. It also is a a good time to get feedback from your team. It’s time to present our work to the client. We usually only show the client three logo design concepts because if we present too many it actually makes it more difficult for them to choose. We pick the best out of the bunch, we pick what we feel meets the briefs requirements. When the job is finally approved we like to celebrate by drinking 🙂 Being in the creative field can sometimes be daunting, just like a writer get’s ‘writer’s block’, so does a designer. Not all the logo’s we design are quick and easy, it takes time and planning. It is after all a business face to a name. When given a brief, every designer interprets it in their own way, and if the assignment is given to 50 different designers, it would return 50 different logos, few of them would look like each other. We must remember, the ultimate judge of the logo design may only be the satisfied and paying client. The moral to this story is to work hard, but not be too hard on your first concepts as the process itself, is the key to ultimate success. Like all creative things, there are always trends that come and go. Some trends turn out to be quick, while others have a longer and more impact. One trend that has been raising eyebrows in a good way is flat logo design. What is flat design? According to Wikipedia, it’s a design aesthetic that is minimalism and does not have that 3D effect. For example, you it does not have any drop shadows, gradients or textures in flat design because all stylistic choices give the impression of depth. There’s a website entirely devoted to showcasing flat design in all its wisdom. Apple is the perfect example of a massive tech company that was well ahead of the flat design trend that’s taking the logo world by storm right now. Its current logo, which meets all of the requirements for a flat design has been around since 1999. However, Apple has until recently embraced skeuomorphism, which explains why so many Apple buttons and icons in the company’s products and website were in 3D. After iOS 7, it became clear that the Apple shifted more committedly to flat design than ever before. It did this at the right time, when this design aesthetic was just taking off. It has to be noted that Apple’s shift to a flat design is more slow instead of quickly. For example, the icons and buttons of iOS 7 simply look flatter than any other Apple user interface of the past; technically, they’re still not 100% flat…but it’s a work in progress! Why Is Flat Design So Popular? One reason a trend begins to gain popularity and pop up in increasing places is because of it’s coverage. Flat design has been covered in many outlets over the past few years. As more consumers get exposed to this design philosophy, it resonates with them. But that doesn’t account for all of flat design’s “takeover” effect. Take Microsoft for example, In 2006 it played around with flat design with its now-obsolete Zune player; in 2010, it applied flat design to its Windows Phone 7. The availability of these products to their customer helped to make flat design take presidence in the collective consciousness of its customers. The increased exposure to flat design also found it’s way to more brands adopting flat design for their own logos. Look at Facebook and what it’s done with it’s= buttons and icons. Facebook just switched to flat design for the logo graphics of its various pages. Whereas pages for developers, privacy, security, universities and mobile once sported a noticeable, 3D look, they now proudly show a flat design aesthetic. Google also jumped onboard the flat design. For example, this screenshot of Google Now, the company’s “intelligent personal assistant,” clearly shows a flat design aesthetic. Vibrant Colours Make an Impression – One of the trademarks of any flat logo design is bold and striking colours. This is not just a stylistic choice; it’s driven by desire. Since flat design removes elements like drop shadows and gradients to present a 3D effect, graphic designers have to use another way to indicate where one border or line ends and where another begins. By increasing contrast by way of colours, flat design is able to achieve this. Clean Look – Because of its emphasis on minimalism, flat design creates a clean look. An clean look is useful in logo design because it communicates what your brand’s about so much more effectively and quickly rather than a complicated logo. In the end, this helps your customers connect much more easily with your business. Better on Mobile – Flat design is a lot more mobile-friendly than any other design approach. This is something of a contradiction because buttons and icons in 3D were very popular in the early days of mobile phones. But, as time has passed and developers have understood more about designing, it was discovered that flat design scaled a lot more easily on a mobile. Flat design has already made a big impact, and it’s here to stay for at least a while. What originally began as a quiet move by Microsoft has now expanded to where more tech companies are jumping aboard the flat logo design bandwagon. It’s interesting to note that a lot of old economy business have already been using a flat design in their logos for some time. If you think that your brand can benefit from this, then you should think hard about getting a DesignLab to design a logo for your business that uses this flat aesthetic. After all, it’s trendy to advertise this design on your logo. We know that trends don’t last forever, but it’s safe to say that flat design still has a long life ahead. It’s helpful to understand how colours of a logo can affect your brand perception, whether you create a 3D logo or a flat logo design. This is a video for anyone interested int designing a better corporate logo with a high-impact and lasting effect based on good logo design principles. Time to quit design? Has technology gone too far? 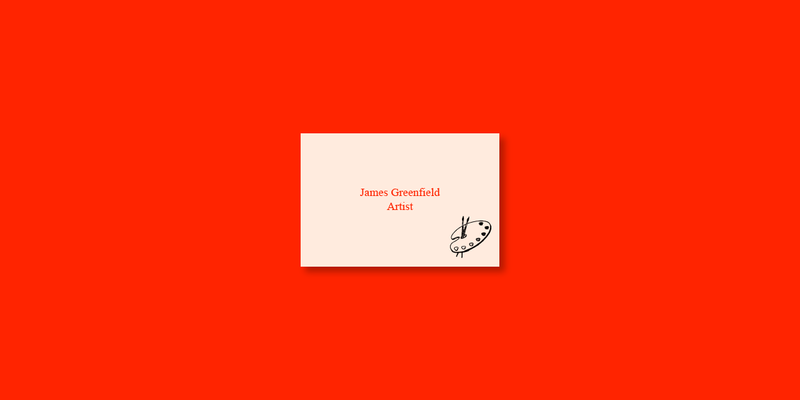 Is it time to quit design? Has technology gone too far? Logojoy is a new website that uses AI (Artificial Intelligence) to ‘design’ your logo. There seems to be no more need for checkout chicks in supermarkets any more. Now they have a machine that can simply scan your item by the barcode and then you insert your bankcard in it and off you go. The need for one on one service is slowly diminishing. It’s happening everywhere, and slowly creeping into any industry. One industry I thought it would never affect is my industry – logo design. Well it’s proven me wrong. 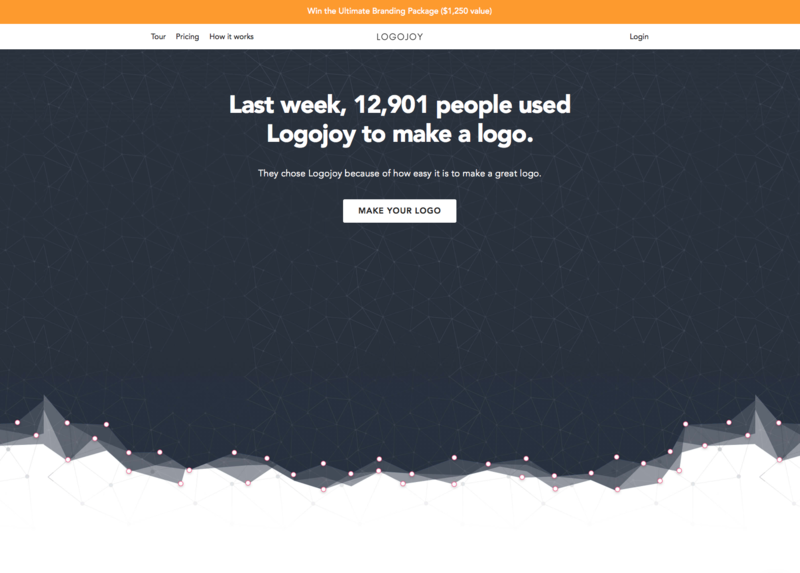 There is a new site named Logojoy. The website proudly says, “By using artificial intelligence, genetic algorithms, and a few other fancy technologies, we’re empowering everyone to design their own logo.” What is a ‘genetic algorithm? and does it make good logos? I wanted to test this, so I signed up and got designing. As the owner of a design agency I thought we should run this against our own visual brand and its simple ingredients of a face, some typography and a strap line. You start by choosing five logos you like from a set of over 20 (can you see where I am going with this). Some straight-down-the-line algorithms later and you’re staring at your logo, well not really, because you’re then choosing what typeface, what colour, and how big everything is and how it relates, and it’s a online version of a very basic PC paint package. Basically you’re just starting with some templates based on things you liked. My icon is chosen, a yellow colour palette checked and a sans serif font selected and [above] is my result. Credit card details entered and $20 later I have gone for the cheaper alternative, money talks after all and cost (and there was even a 50% sale) and the files are emailed to you in a flash. After reviewing the new logo I think I will stick with the one we created. News of the graphic designer’s extinction and replacement at the hands of AI is still premature. At DesignLab we work with our clients to achieve them the best results for the business. Logojoy can’t help you unlock the potential in your brand, connect it with your potential customers and fans or deliver this level of service. It can’t help you understand your market, it can’t build confidence or engage audiences. What it does is give you a very average non-descriptive logo, and it will probably make some money for some clever people who created the site. LogoJoy is a generic site looking for stuff that comes out, but isn’t all graphic design derivative in some way? However extensive a library of fonts is, or icons and shapes can be, the process just keeps this at the same level as the graphic design noise we all experience on a daily basis. 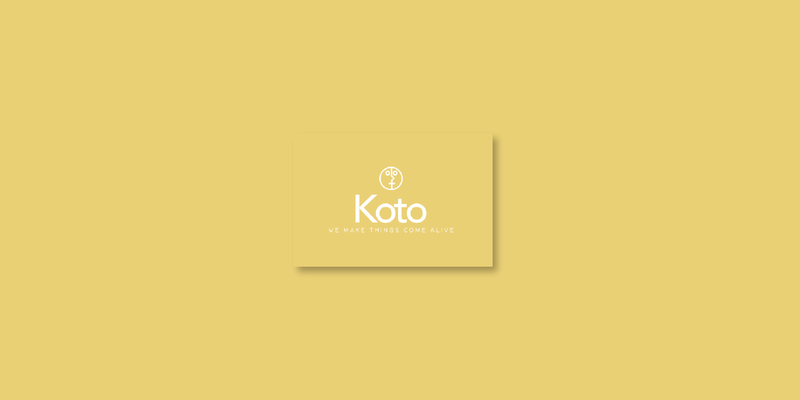 The coffee shop that has slightly over roasted coffee and no experience, the sole trader business owner that wants their brand to be amazing and captivate it’s audience, but does not want to invest money in a corporate identity. They’re the businesses that will use Logojoy, because they want cheap and quick, they don’t see the value in design, and the difference it can make to a business. Graphic design does not have to cost the earth, or be complex, but it does have to have heart and thought, and the AI robots are missing that vital ingredient, it’s that years of experience that a robot can never provide. There will always be a market for this kind of thing and more fool the people that use it. Buy cheap, buy twice. December 14, 2016 admin Logo design Comments Off on Time to quit design? Has technology gone too far? Logo rebrands are a necessary step to take in the world of business; this could be because your current logo is confusing to customers, or it doesn’t sell your brand message correctly or it’s simply out-dated. But, this type of redesign can be a minefield and your loyal customers may lose the emotional connection that’s cultivated over the years. It’s safe to say as a society, we don’t like change. Sometimes it can seem no matter the size of the brand, it seems it send out a negative message to your market; this is because we align ourselves with the brands we engage with. We tend to take on their identity, and when the design changes, we are concerned the brand is going to change with the new logo. In short, the stronger emotional bond we have to a brand, the more negative our reactions are when they change their design. Brand’s risk losing their audience with a new design, and though many seek advice from logo design agencies, the water’s a muddy and a rebrand is a treacherous place to be. What big brands had had their logo redesigned for 2016, and how did we react? Head of design for Instagram Ian Spalter explained the design as a response to Instagram user evolving from a place to simply share filtered photos to a community platform that is vibrant and diverse. Not only did the logo change, but it’s sister apps have undergone a similar makeover; Boomerang, Hyperlapese and Layout have all been given the vibrant look the brand want to evoke. The infamous Saul Bass once stated “Logos are a graphic extension of the internal realties of a company”. 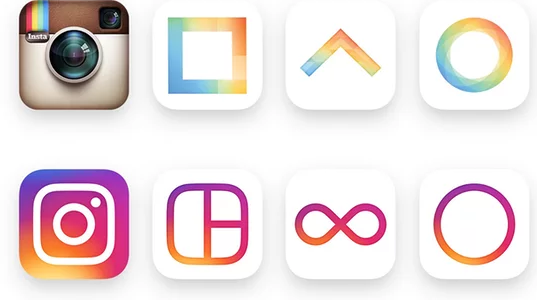 Instagram are using their new logo to speak to their users, without the need for written communication, whether we like it or not. Netflix has become the world’s leading internet television company. It nearly avoided a PR backlash in June 2016 thanks to their announcement regarding their “not new logo” and proclaimed the new icon was simply to accompany the current logo. This new ribbon effect “N” against a black background icon mirrors the current logo and though the ribbon effect is very pleasing, though some feedback is it serves no purpose. And when compared to the negative comments Instagram’s new logo received, Netflix has every right to be feeling good. This rebranding failure haunts us time and again. Remember in 2010 when Gap unveiled their brand new logo. It brought a global attention, for all the wrong reasons. The brand that held a firm identity by its logo for over 20 years had suddenly changed overnight, and no one was happy. One of the reasons the logo failed so badly was thanks to the use of the font. This typeface is so overused, so therefore it failed to create any unique visual appael for the audience to hold onto. After just 1 week, Gap reverted back to their old logo, with a rough estimate of around $100million lost in the rebranding process. Not every logo design failure is because of a rebrand; some are just terrible designs. For example the 2012 Olympics proved that, and thanks to the rise in social media, failures are now less contained than before. 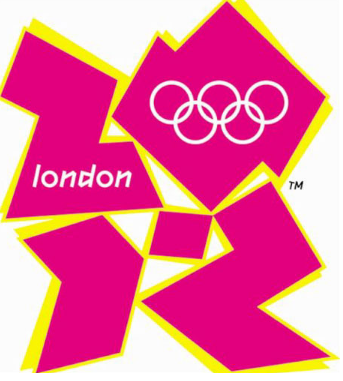 The logo’s intention was by being bold, spirited and some say jarring, it would echo London as a diverse, modern and vibrant city, though the internet had different ideas and the design was alluded to an X-rated image that soon reached viral status. “Brands, logos, and products develop deep connections and associations with people, so you don’t just want to change them for the sake of novelty”. In summary, if a redesign seems more just self-indulgent, pause and step away, or you risk alienating your customers, but if it’s necessary, then do it properly and hire a professional design / branding agency! Want to know how to design a logo like a professional? Well that takes years to master. This is why you seek a professional design agency in Adelaide such as Designlab. However I can guide you to an easy and quick breakthrough of how we approach a logo. Before you can design a logo, you must understand what a logo is, what does it represent and what is it supposed to do. A logo is not just a mark – a logo reflects a business’s brand by the use of shapes, fonts, colour, and images. A logo inspires trust, admiration and recognition for a company and it’s our goal as a graphic designer to create a logo that meet its objective. One must know what a logo is before continuing. Read about what is a logo check out Wikipedia’s. Now that you know what a logo is, and what it represents you must learn about what makes a great logo; the basic rules and principles of an effective logo design. A logo must be simple, it’s design allows for instant recognition and the logo should be versatile & memorable. A good logo features something unexpected without being overdrawn. An effective logo should stand the test of time. Will the logo still be effective in 10, 20, 50 years? A good one does. An logo design should be memorable and this is achieved by having a simple, yet, appropriate logo. How you position the logo should be appropriate for its business. For example, if you are designing a a logo for restaurant, it would be appropriate to use a classy font & colour scheme. An effective logo needs to work across a variety of applications and mediums. Logos should be designed in vector format, this ensures they can be scaled to any size. The logo must also work in just one colour, as well as colour. Now that you know the basic rules of good logo design, you can distinguish the differences between a good and a bad logo… By researching why other logos have succeeded, and why they have succeeded can give you a great insight into what makes a great logo. A great example, is the famous Nike Swoosh. The logo was created by Caroline Davidson in 1971 for only $35 yet it’s still a strong, memorable logo and effective without colour. It’s simple and fast and represents the wing in the famous statue of the Greek Goddess of victory, Nike – something which is perfect for a sporting apparel giant. Nike is just one of many successful logos, think about other famous logos that you know about and check out their logos – what do you think makes them successful? Check out Logo Of The Day, it has some successful and not so successful logos, worth a look. We can also learn off logos that are not successful (look above in the picture or view these bad logo designs. Some logos can depict things that may have not always been noticeable to a designer or they are simply just bad design. Now that you know what a logo is, what it’s principles and rules of logo design are, and what makes a logo successful we can finally begin designing. This is the hardest part and is its own topic in itself – Each designer’s logo design process is very different however check out The Secret Logo Design Process Of Top Logo Designers for a guide. After you have got your design ideas planned, it is usually a good time to begin learning your software (Adobe Creative Suite is the industry standard) but remember you can’t design a logo by just hopping straight onto the computer… brainstorm first! After you have your initial sketches you can then usually jump onto a computer to start drawing your logo. After you have got a great concept you can send it to your client, get feedback, and (eventually) finish the logo. If you require a quote or just want to chat to someone from our team contact Spiros on 0431 926 575. Professional Logo design today is totally under rated. People do not understand how important a good logo is and how valuable it is to their business. We are going to outline some very important points explaining to you exactly why logo design should not cost $99, and why your logo is not something you should ever take lightly. We will do this by comparing “cheap logo design” to “professional logo design” and we will outline the reasons why professional logo designers don’t charge low fees and why you should invest in a professional logo design. To really understand what a logo must achieve, we first must know what a logo is. A logo’s design is for immediate brand recognition, it inspires trust, admiration and loyalty. A logo is one aspect of a businesses brand, or economic entity, its colours, shapes and fonts usually are different from others in a similar market. Logos are also used to identify business. It makes us so frustrated as to why some people have no logo, or why they would even bother with a getting a cheap logo designed if a logo is meant to do all of these things. Before we get into comparing cheap vs professional logo design I want to talk to you a bit about SPEC work. “Spec” has become the short form for any work done on a speculative basis. For example. If you design this for me, I will pay you if I like it. – This is clealry not right. To explain, let’s create a scene in another industry where SPEC work does NOT exist. This sort of thing happens in the design industry every day and is ruining the design industry. A designer should not have to invest time and resources with no guarantee of payment much like a dentist or any other professional. Check out these comics below about Spec Work, they are very amusing. What quality can you expect for a logo in between the $5 – $200 price bracket. Have a look at the following link $35 logo design contest that was held on Digital Point Forums. Below you can see the concepts from the contestants, which one do you think won? You will notice that nearly all of the logos above use free standard issue fonts and don’t assign to the rules of what makes a good logo. Ie. memorable, effective, describable and scalable. How many of the logos can you describe or remember? 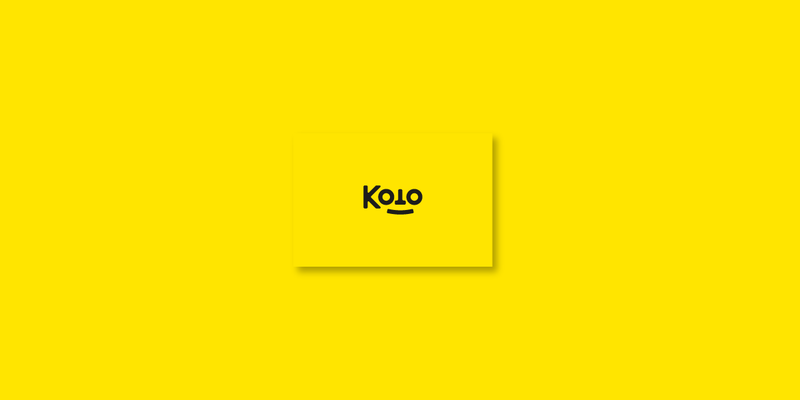 Do you think these logos are effective without colour? Do they gain immediate recognition of what they are? Do they convey the company’s character or personality? Do they relate to your clients by conveying a feeling of credibility? Do they have association with quality? Now compare these professional logo designs and answer the same questions as above…. Why are they so different? Because professional logo designers have a process that involves research and conceptualising and this is why they do not charge $99. A Design Brief: This is a questionnaire and interview with the client to create a design brief. Research: Conduct research focused on the market itself, on its history, and its competitors. Conceptualising: Develop logo concept(s) around the brief and the research. Reflection: Taking breaks throughout their design process. This lets ideas mature and get them renewed enthusiasm and get feedback. 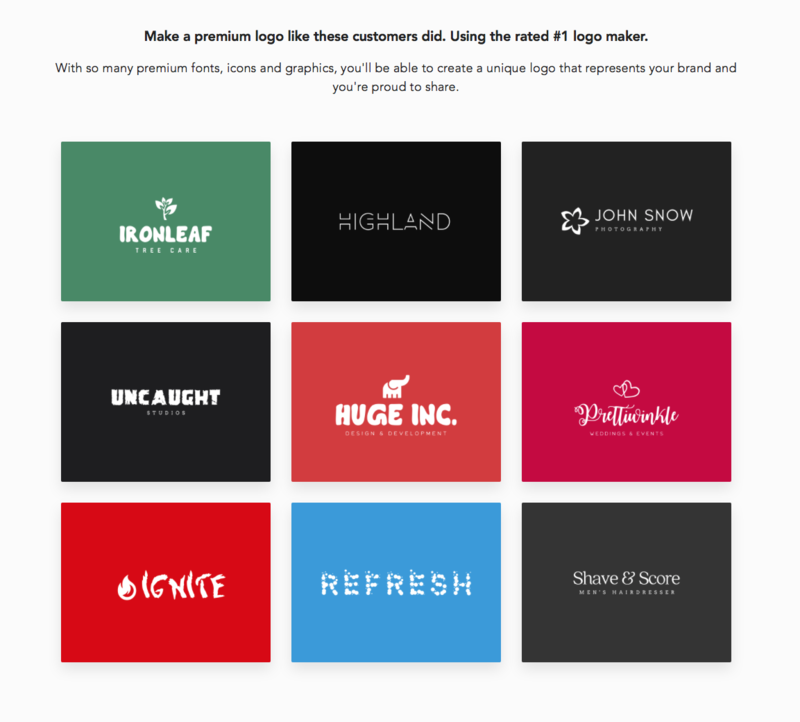 Presentation: Choose whether to present only a select few logos to the client. Do you believe doing all of that costs $99? On that note, did you know that the software used to make the logo is around $2,000 in itself, let alone the computer or the costs associated with essentials… i.e. paper, ink and an internet. Here are some more responses from other designers on reasons why logo design does not cost $99. A logo is the first impression your customers get of your business. A logo needs longevity, it should stand the test of time. A logo needs to be original (not a copy from somewhere else). A logo should look professional. A logo should reflect the business. A logo is the starting point of your corporate image. Now look back at those $99 logo designs to see they follow the above points. This is the most frequently asked question, and as we say to all our clients it is the hardest one to answer without more details of the project. The cost of a professional logo design is a question that cannot be easily answered as every company has different needs, the best way to approach this question is to draw up a customised quote for each individual. This is how we approach it at DesignLab. A number of facts have to be taken into consideration when designing a logo, i.e. how many logo concepts, how many changes are required, how much research is needed, the size of the business, does the business need corporate stationery (such as business card or letterhead design). The best way to find out how much a logo design will cost is to get a quote from the design agency. Isn’t it about time you invested in a professional logo design? Should you trademark Or copyright a Logo? Does a Company Need to Copyright a Logo? We get this question all the time from our clients, and it’s one we often find difficult to answer.We get this question all the time from our clients, and it’s one we often find difficult to answer. Should you trademark or copyright a logo? Copyright and trademarks are used to protect the owner’s intellectual property against infringement (copied). Copyrights usually apply to written films, work, music and computer files. Trademarks consist of symbols, words, phrases or a combination of the three that represents a company on signs, documents and marketing materials. Because logos include original artwork, a company may wish to get both a copyright and trademark to protect itself from another company using the brand recognition for its own benefit. Does a Company Need to Trademark a Logo? A companies logo is among the most valuable asset a business can possess. A logo helps customers recognise and identify the company and distinguish it from other competitors. A logo is one of the most common forms a trademark takes. Companies do not need to trademark their logo; simply just by using the logo in commerce, the company already has a trademark. Logos often contain pictorial or a graphic element, this means the mark may be eligible for protection as both a trademark and copyright if it is an original work of authorship or otherwise meets the copyright requirements. Whether the company needs to register the mark or also seek protection as a copyright depends on many factors. Businesses should seek the advice and counsel of an attorney before proceeding. How to Find Out if a Logo Is Copyrighted? Two intellectual property terms dictate the indication of the ownership of a logo. These terms are names “copyright” and “trademark.” The designer of the logo automatically owns the copyright to the logo created, unless the designer has sold the copyright. A trademarked logo is a logo used as an identifying mark for a company. The best practice regarding the use of any logo is to avoid using it until you have determined the logo’s availability. Look for an identifying mark or name on the logo. If an image or design for a logo is copyrighted but not trademarked, it may contain a phrase that contains the word “copyright” followed by the year of copyright and the name of the copyright holder. It may also include a copyright symbol © and date of copyright followed by the name of the copyright holder. Look for a registered trademark ® to determine whether the logo is trademarked. While the images used in a logo may be copyrighted by a designer, most companies register a logo as a trademark rather than copyright. In most cases, you will be looking for a trademark ownership and not a copyright one, for example with McDonald’s and it’s golden arches logo. The name of the company that owns the trademark for a logo will be included with the registered trademark symbol. February 15, 2016 admin Graphic design, Logo design Comments Off on Should you trademark Or copyright a Logo?